Summer is almost here, and for many people, that means it’s time to fire up the backyard grill. That can be a relief, as it could mean less mess in your kitchen, and it’s a fast way to serve a delicious meal to a larger group of people if you’re entertaining. Besides, whatever your food preferences, there’s something special about a juicy burger, succulent steak or grilled veggies cooked to perfection on an outdoor barbecue. Like anything else, though, not all barbecue grills are created equal. There are differences in taste (and only you know which you like best), but also differences with respect to energy efficiency. What’s the most energy efficient grill? First, we need to look at the various types of grills. Second, let’s look at your immediate objective. Are you in the market for a barbecue and trying to decide, based on evaluating the difference between propane and natural gas grills? Or, you could be considering an electric. 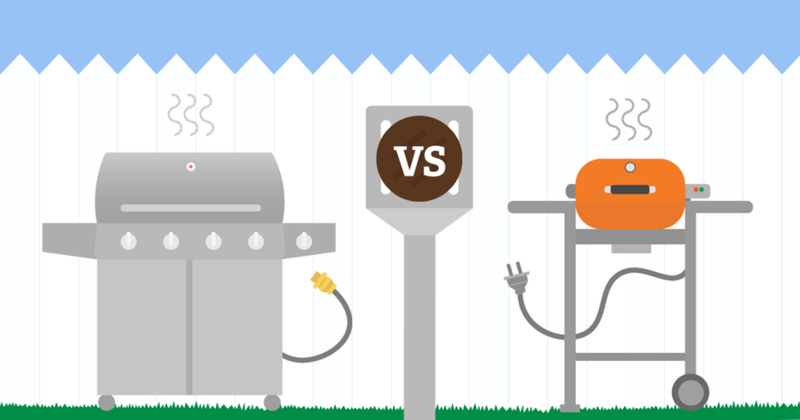 Today, we’ll look at the differences between propane, natural gas and electric grills. While there are still charcoal barbecues in existence, they’re not nearly as commonplace as they used to be, in part because it’s been shown that charcoal burns much more carbon than the alternatives. Traditionally, people tend to think that an electric grill offers the least authentic barbecue flavor to their food, so that might be a big consideration as you decide between an electric vs. gas grill. They might not be looking for the most energy efficient grill, but rather the one that offers the best taste. Depending on where you live, an electric grill might be your only option. Pros? They heat quickly and can be used anywhere… on an apartment balcony, for example. They also don’t require fuel other than a single electrical outlet. So, if you’re a city dweller who craves some barbecue delight, you might be able to plug in an electric grill on a balcony or in a small courtyard and have a meal that satisfies your craving for home-cooked barbecue. The con is that electric (vs. gas grill) would not be able to generate a high enough heat to sear food. Gas grills are the most commonly sold grills today. If you’re choosing between a gas grill vs. electric grill, either might suit your needs, but a gas grill arguably offers better flavor to your food. Still, let’s look at some pros and cons that could help you decide between the two. Some gas grills come with features that include side burners and rotisserie kits. Unlike charcoal grills, gas grills are quick. You could have one heated and ready to grill in as few as 10 minutes. There is a difference between propane and natural gas grills. 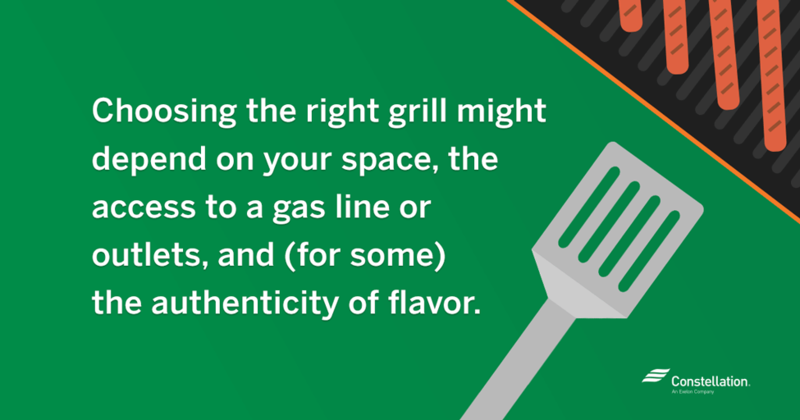 Whatever grill you own is equipped for a specific fuel, so know ahead of time if you’re using a propane vs. natural gas grill and plan accordingly. Gas grills require a lot of space. They cannot be used in any structure that is even slightly enclosed, and in fact, they need to be used far away from any building. There are some local laws or ordinances that might require a propane vs. natural gas grill (or vice versa). Before you spend money on either, check your local code to make sure that you’re purchasing one that’s permissible in your community. What are the differences between gas and propane grills? If you’re trying to choose between propane vs. natural gas grill options, there are a few factors to consider. One: Where do you live? Natural gas grilling might not even be available to you if there isn’t a convenient natural gas line. Often, if you live outside a municipality, there is no direct access to natural gas. But, if it is, natural gas can be both convenient and more cost-effective than propane. Generally, natural gas burns “cleaner” than propane. There’s not much of a difference between propane and natural gas grills when it comes to food quality and taste. The bigger consideration when it comes to propane vs. natural gas grill use is energy and cost. You can purchase propane in a tank at most convenience stores, gas stations or supermarkets. If you’re using natural gas, you purchase from the gas company and the line hooks up from your source directly to your grill. What are some other differences? Natural gas tends to be less expensive than propane. Propane can be more dangerous if not used properly. Propane gas is heavier than natural gas, which means that if released, it would fall to the ground and could cause an explosion. By contrast, natural gas would rise into the air and evaporate. Natural gas does often cook more quickly than propane would, and if you’re hooked into a natural gas line, you’ll never run out of fuel. Propane tanks empty, and you don’t want to be hosting a barbecue and have your barbecue fuel depleted! Another difference between propane and natural gas grills is the portability. You can wheel your propane grill anywhere that is safe for barbecuing. 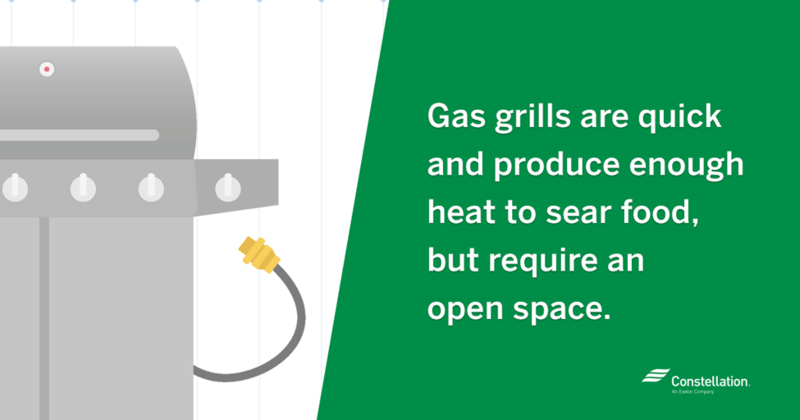 Because a natural gas grill is connected to the gas line, you’re tethered to one spot. Still, if you’re evaluating whether a propane vs. natural gas grill would best meet your needs, bear one thing in mind: Most propane grills can be converted to natural gas with a few adjustments. The gas company would be able to advise as to the parts necessary to make the switch. So, if you’ve already purchased a propane grill but are considering natural gas, it’s usually possible to make the switch. So what is the most energy efficient grill? If we’re comparing gas vs. electric grill efficiency, we can look at the numbers: The average electric grill uses 1,250 watts. How much money you’re actually spending will depend on the rate you pay for electricity. 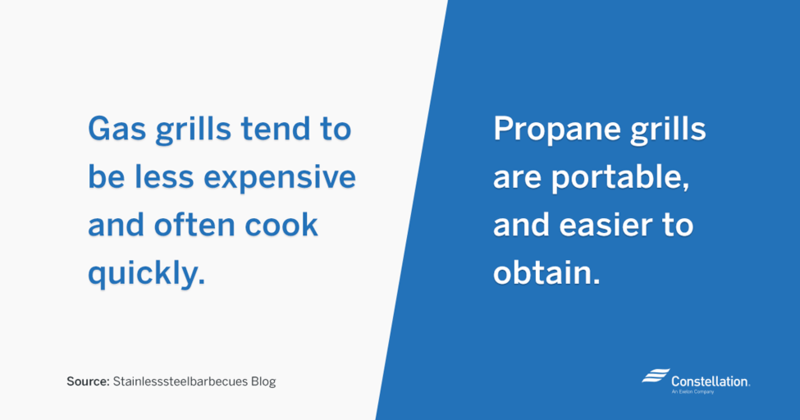 It’s easier to determine the cost of your barbecuing if you’re using a propane grill, because you know exactly how much you paid for the liquid propane at the store. If your home already uses natural gas, your cost involves two factors — the cost of the grill itself, and the cost of an additional gas line. If you already have a propane grill, you can get a conversion kit (usually for fewer than $100) to use it as a natural gas grill instead. Like any type of appliance, the cost of the specific grill can vary widely. Gas grills could start around $250, but a high-end model could be more than $10,000. A gas line could cost $25-$75 per foot for installation if your home is not already equipped with one. This would require the services of a heat contractor, and the cost would depend on the distance from the house to the gas main. There also could be requirements with respect to municipal permitting for installation of a home gas line, so be sure to check your local regulations. With all of these factors taken into consideration, HomeAdvisor estimates that the average homeowners spend between $133 and $347 to install a natural gas barbecue. Still, if you’re comparing gas vs. electric grill efficiency, there are really two main costs for electric — the cost of the grill itself, and the cost of the electric energy. If you’re using it in an “average” way (grilling once or twice a week but not every day), you might find that in the energy efficiency realm, it’s less expensive to use an electric grill vs. gas grill. Generally, one unit of gas is about three to four times less expensive than one unit of electricity. A gas (vs. electric) grill also heats faster, which means that it’s using less energy per cooking time. Some food enthusiasts still maintain that there’s no comparison between an electric vs. gas grill when it comes to barbecue flavor. After all, an electric can’t get that open flame that you can achieve with gas. 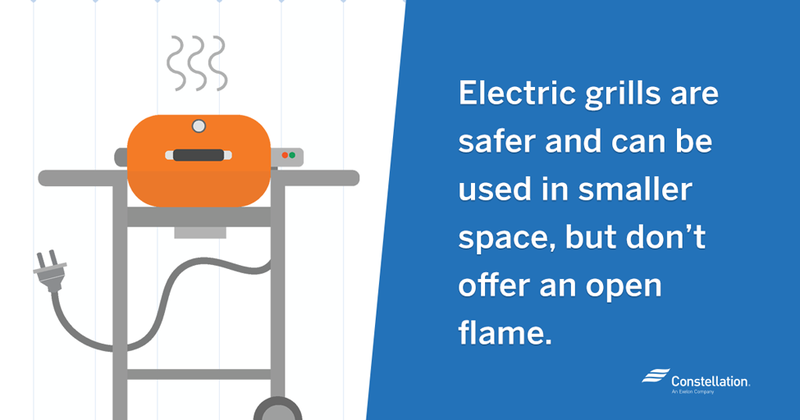 But, in lots of ways, an electric grill is safer — if you’re someplace that might be more indoors (in a garage, for example, or on an apartment balcony), that could be the only safe choice. What’s your preference? Do you insist on the flavor that comes from a gas grill, or do you like the portability of an electric? Share your comments below. We’d love to hear what you think! And, regardless of your grill preference, you can find other ways to save on home appliance energy use. Remember to check back here often for more home energy efficiency tips! There is really only one way to truly grill and that is using charcoal. Hi, John! I know that is a common sentiment. Lots of people do believe that the taste of charcoal-grilled food does not compare to any other kind of grilling, which is why there are still charcoal grills on the market. Thank you for taking the time to comment! Your expense comparison makes no sense to me. Why would an electric grill be less expensive to use than a gas grill if (as is stated) a unit of gas costs 3 to 4 times less than a unit of electricity and a gas grill cooks quicker using less energy. Your expense comparison also runs contrary to what I was told by a HVAC professional. I was told that a unit of electricity costs less than a unit of propane. This is why my electric heat pump is set to heat my house down to an outside temperature of 20 degrees. Only then does the propane furnace kick in. This arrangement would make no sense if it was cheaper to heat my house using propane alone. Hi James, we’re sorry that our cost comparison was misunderstood! Comparing cost of electricity, propane, and natural gas, is, like we stated, hard to align perfectly. Energy experts sometimes have different opinions on cost comparison, based on their experience and what they specifically work with usually. Here at Constellation, we want to relay the best energy information we have to our readers, but also encourage our customers to ultimately make their own decisions on what energy to use. We hope that this blog post was able to help you in some way!